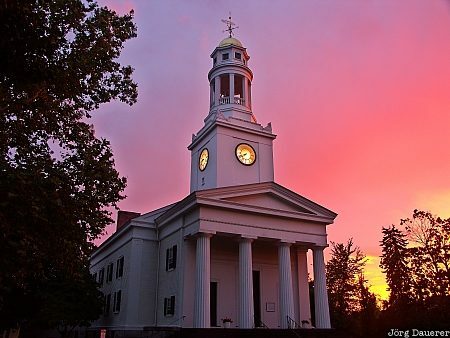 First Parish Church in Concord in front of a spectacular sunset. I took this image in the evening of a rainy day. In the late afternoon I had given up taking photos in Boston for that day as is was heavily raining. I was on the way back to my hotel when the sky cleared up in the west. When I arrived in Concord I saw this sunset spectacular behind First Parish Church. Concord is in the eastern part of Massachusetts, United States. This photo was taken in the evening of a rainy day in August of 2004. This photo was the image of the month in February of 2010. This photo was taken with a digital camera.